Global evidence of a strong business case for investing in women and leveraging their potential as entrepreneurs is emerging. The ‘Women Investing in Women’ movement can play a significant role in addressing the systemic access to finance challenges that women entrepreneurs contend with. The report takes stock of the access to finance challenges experienced by women entrepreneurs in India and the resulting financing gap. It explores the potential of the ‘Women Investing in Women’ movement to address those challenges and enhance access to finance for women-led start-ups and small businesses. 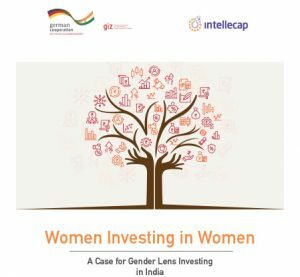 The core objective of the report is to identify a strategic roadmap for strengthening this movement in India to further the adoption of gender lens investing. This report will be a valuable resource for a range of ecosystem stakeholders including regulatory agencies and government policymakers, development agencies, foundations, private sector companies who aim to strengthen the women entrepreneurship ecosystem in India. It is expected to inform policy formulation and intervention design targeted at strengthening gender lens investing in India.